Our latest eBook release, produced with the help of Distributed Proofreaders, is In the Wonderful Land of Hez, another Brave & Bold adventure written by the same author as our earlier release, In the Depths of the Dark Continent. Like that earlier adventure, Hez tells of intrepid explorers discovering a little-known civilization and battling monsters in an unfamiliar place. Of course, the details differ a bit: the unknown civilization here is ruled by women and centered around the Fountain of Youth, the monsters are huge, bloodthirsty turtle-spider hybrids instead of giant crabs, and the unfamiliar place is Florida rather than Africa. There’s also a bit more (extremely unromantic) romance on display here, and the whole thing ends in a surprisingly abrupt fashion. 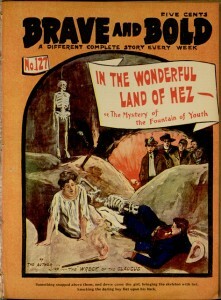 Like many adventures published in Brave and Bold, this story first appeared in the Golden Hours story paper in a longer serialized form under the title Under the Everglades; or, Two Years in a Land of Mystery. The abridged nature of this version of the story is made apparent by occasional abrupt leaps in the narrative, but the truncated text is sufficient to convey the overall flavor of the narrative, which is definitely a product of a different time. 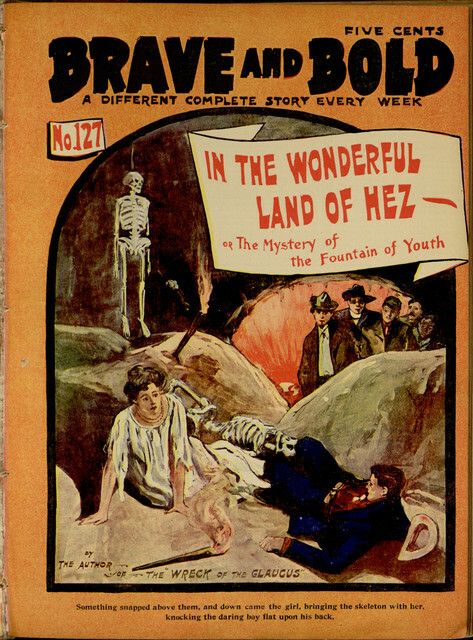 The story may be read online or downloaded in eBook format through Project Gutenberg.